I don’t know about you but since becoming a mom one of the more frustrating things to purchase for little baby Digger has been socks. She is a magician when it comes to getting her socks off and finding a brand that doesn’t slip off has been difficult. I tried all the brands that my local stores sell and haven’t found any that have stayed on her little tootsies. What’s more frustrating is stores will only carry two brands of socks and I’d already tried those with no luck. Wouldn’t it be nice if you could just go to one spot and see a large selection of just socks, leggings and tights? In comes KidsSocks.com! KidsSocks.com offers a HUGE selection of socks for babies and kids. Their site is so organized and easy to navigate to find exactly what your looking for. Dress socks? Basic Socks? Knee Highs or Tights? All of the types of socks are nicely laid out in their navigation and you can shop by girls, boys, baby or choose to browse by age or brand. Any way you want to shop it’s easy! They have any kind of sock, legging or tight you could want from basic styles to adorable print patterned and even some Winnie the Pooh socks. Plus, they offer all the best brands – I’ve never seen so many sock options all in one place! I had heard great things about Trumpette brand baby socks. So I was excited to try them out from KidsSocks.com. 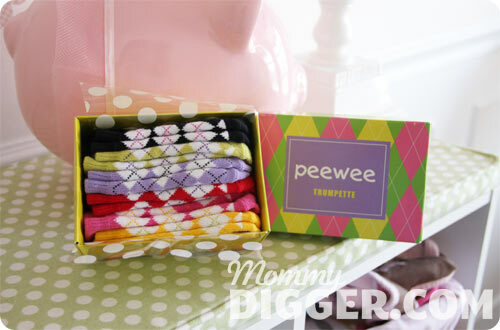 I was able to quickly and easily make my selection of the Trumpette PeeWee Baby Girls argyle style socks and they were on my doorstep in a flash. I put the order in on Friday afternoon and by Monday afternoon they had arrived already! I opened my box and there were 6 little adorable pairs of argyle socks. I wrestled with my daughter and put them on, getting dressed has become quite a challenge since she became mobile and apparently she has better things to do than let me put her clothes on or change her diaper :). Anyways, I digress, the Trumpette socks managed to stay on her feet throughout all her crawling, standing up on furniture and walking around on her walker toy. I have to say I’m pretty impressed! By exclusively selling kids socks for girls, boys and baby socks, it allows them to have a site which is more focused, very organized, and easy to navigate. KidSocks.com strives to make it as simple as possible to find the exact product you need. They offer the world’s largest selection of children’s socks, tights, and leggings, featuring quality items in the most wanted brands, styles, and colors. Shop thousands of styles of kids and baby socks and leggings! Visit KidSocks.com – Free Shipping on orders over $30. Win a $20 Gift Certificate to KidsSocks.com! I love the little girls mary janes socks!! I like the TicTacToe Microfiber Baby Girls Tights. I like the TicTacToe floral lace tights. My son would love the shark socks! I love the baby shoe socks! Especially the cowgirl ones! SO cute!